The object of architectural visualization is to show a project or idea in a way that anyone could understand, mostly by using a 2d media. At the end of project we will have something like an illustration of a project. But, with all technology available today, a few clients still want a physical model along with a rendered image. This is a completely different field of expertise, but architects may need to create their own models to study a project or evaluate the overall look of his design. Back in college I had to create a physical model along with technical drawings for almost all my designs. If you ever tried to work with those types of models, you probably know how hard it is to plan and create the designs to cut the paper and create the model. Wouldnâ€™t it be great if Blender could help us out? Well, actually it can help to design physical models! An artist called David GuzmÃ¡n just posted at the LuxRender user forums a free eBook about how to use Blender to create paper models, which could be used to help with the design of physical models for architecture. 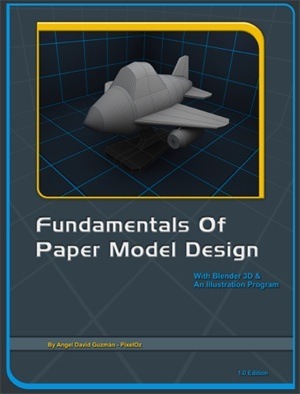 The book is called Fundamentals of Paper Model Design, which used Blender and a Python script, included with the download, to unfold and prepare the shapes for print. How big is this eBook? Well, it has about 227 pages! Itâ€™s not directly related with architecture, but itâ€™s the kind of resource that will help in the design process.